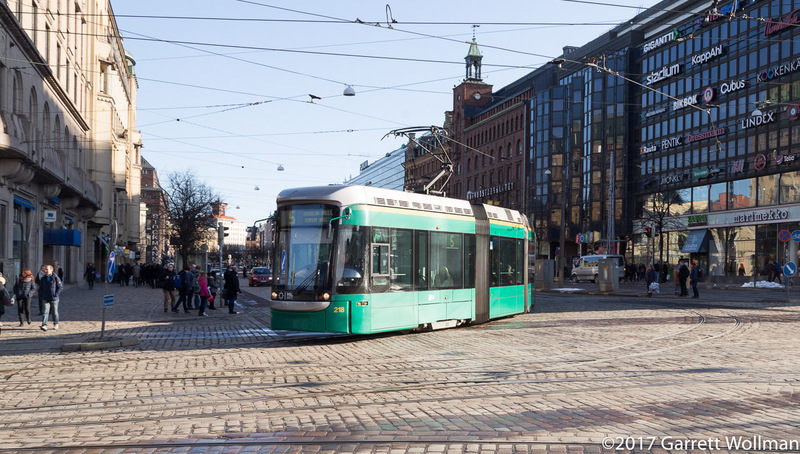 As I mentioned in part 1, Helsinki has trams, or as we’d say in American English, streetcars. 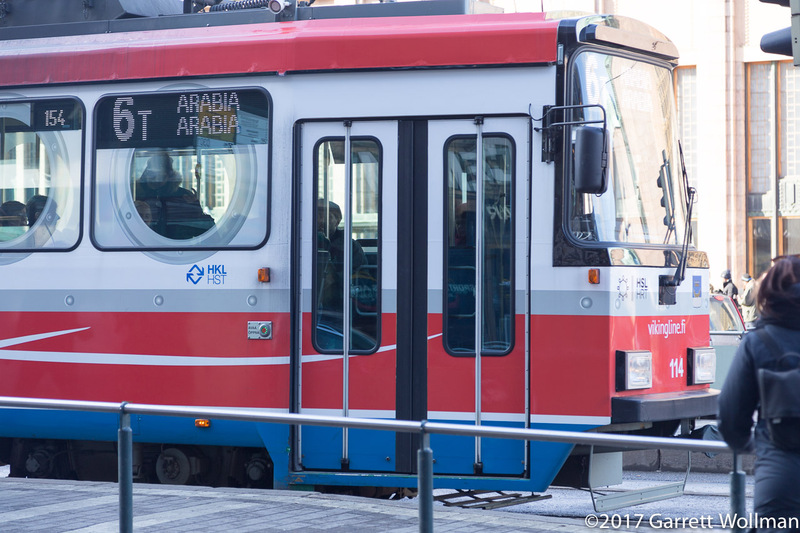 (I try to avoid the “t” word — “trolley” — since to so many people that now means a diesel bus with goofy bodywork, whereas “streetcar” is unambiguous, I hope.) Actual street-running light rail vehicles, in an old, congested central business district with narrow, winding cobblestone streets, hills, and salt water. And yet still has room for cars and on-street parking, not to mention buses, a single-line subway, and all those commuter trains I described in part 2. This post will hit some of the highlights, although I did not ride most of the lines and saw the termini of only three (the 9 in Pasila, the 7B at Senate Square, and the 6 outside my hotel in Hietalahti). 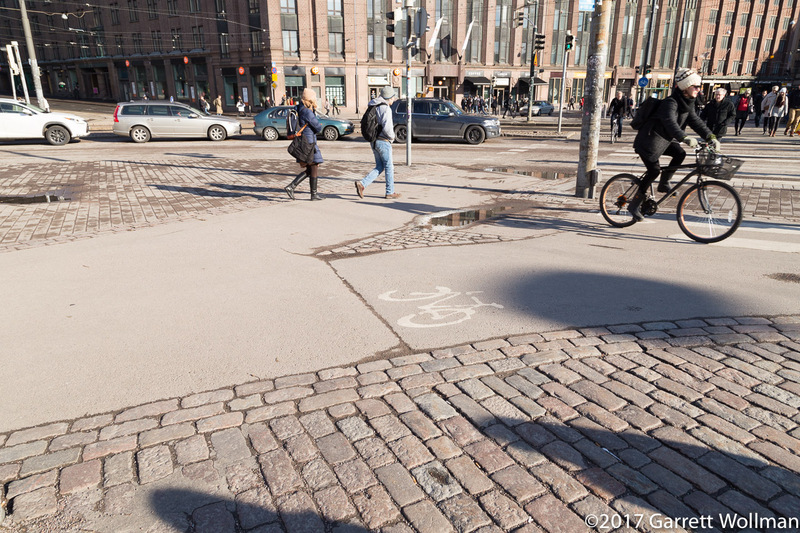 I’m also going to include some other bits of Helsinki transportation that don’t have a whole post to themselves, including bike and pedestrian infrastructure, which I didn’t take nearly enough photos of. I also didn’t have time to visit the tram museum in Töölö. Given another week to spend, I would have taken all of the tram routes, spent more time on the Metro, and visited some of the outlying suburbs by bus and commuter rail — but this trip was expensive enough and thoroughly exhausting, so I was ready to head back home by day 9. One more Helsinki post after this one will wrap things up with some architecture, and then I’ll have some more architecture from my day-trip to Turku — and finally after all that, I’ll close with some photos of my not-quite-a-day in Reykjavik on the way out, if I can remember what any of the pictures were. The photos below were taken over several days, and I mostly was not setting out to document the tram system in any great detail — there are several photos that I find I should have taken but didn’t — so you will probably have an easier time following if you open up the geographically accurate tram network map in another window while you page through the photos. On this trip, I stayed at the Radisson BLU Seaside hotel in Hietalahti, on the working part of Helsinki’s waterfront. This video monitor in the hotel lobby tells guests when the next 6/6T (outside the front door) and 9 (about 100 m up the street) trams will depart for the CBD. 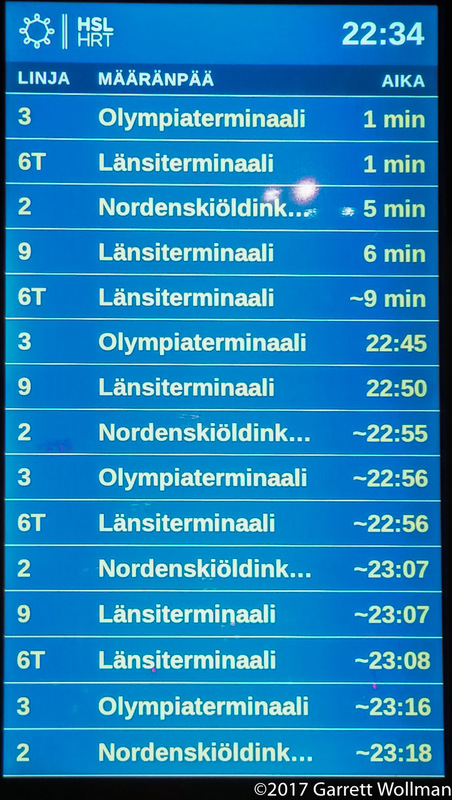 When it’s running, the 6 tram loops here and waits for a scheduled departure; the 6T and 9 routes come up from Länsiterminaali (Western Terminal), one of several ferry and cruise terminals on the waterfront. Westbound trams are not shown. 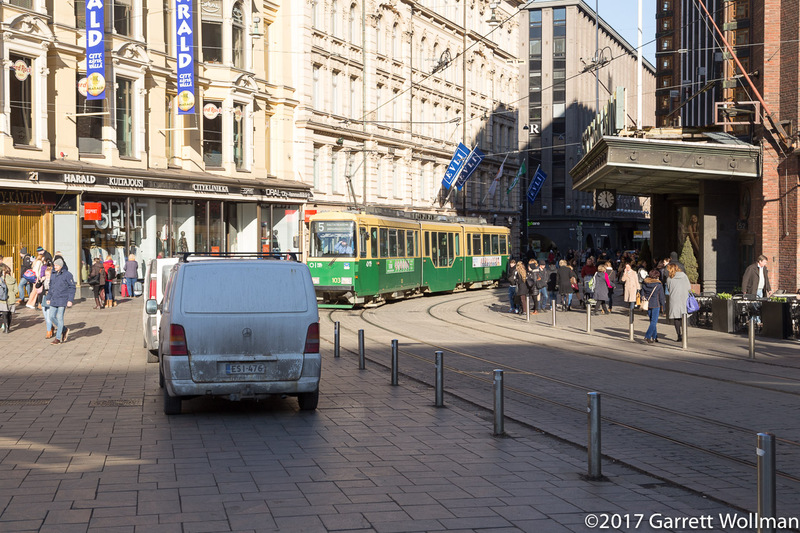 On Kaivokatu in front of Helsinki Central Railway Station, numerous tram routes stop for transfers to the Metro, commuter rail, and long-distance trains. Even late in the evening, tram service is frequent (although most routes stop at 23:30). This is the westbound platform; a similar monitor on the opposite side shows eastbound arrivals (including the 5 route, which loops here and does not serve the westbound platform). 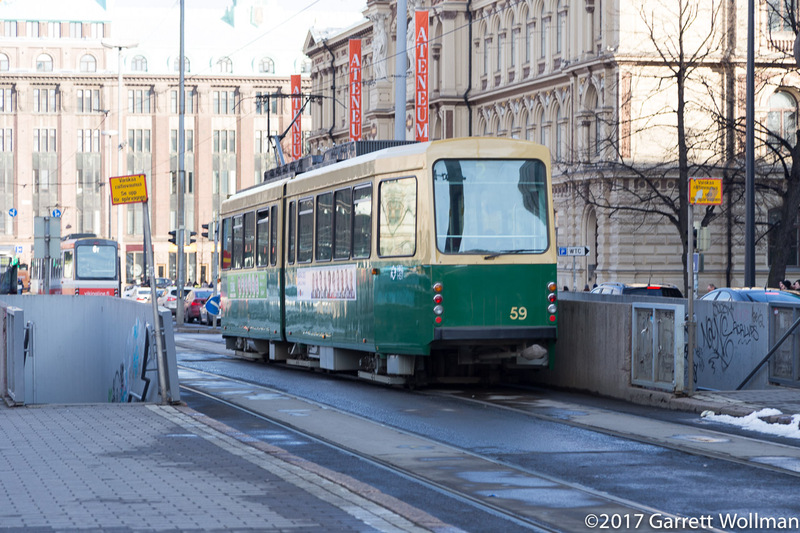 Helsinki has several generations of streetcars (trams) in operation. This one, number 114, is operating on the 6T (Länsiterminaali–Arabia) route, and has a full-wrap advertisement for Viking Line cruises. 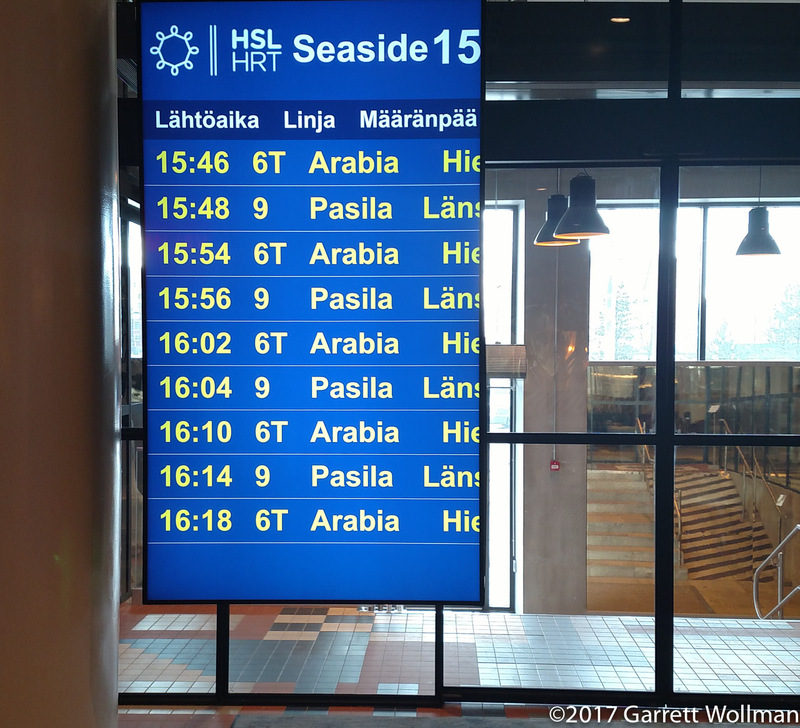 The 6T route operates limited hours to serve arriving cruise ships at Helsinki’s West Harbor, as an extension to the 6 (Hietalahti–Arabia) route, supplenting the 9 (Länsiterminaali–Pasila) which runs all day. In this close-up you can see the older style destination sign and double-wide entry doors. 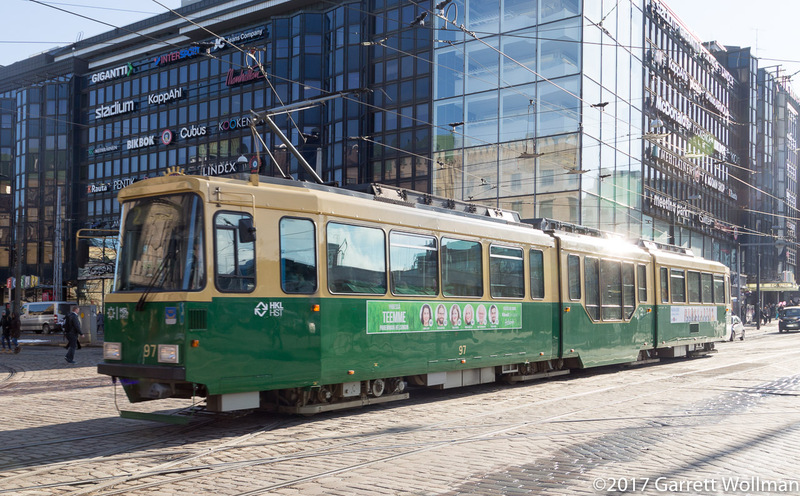 Not also the HKL logo to the left of the doors, indicating that this tram is operated by HKL (Helsingin kaupungin liikenne, Helsinki City Transport) — as indeed are all Helsinki trams. The HSL logo on the front of the tram indicates that HSL tickets and travel cards are accepted. An even older tram, number 59, serves the 2 (Olympiaterminaali–Nordenskiöldenkatu) route as it passes Railway Square. The stairwells on either side of the tram tracks lead down to the concourse of Rautatientori Metro station. A new quadruple-articulated tram, number 234, is working route 2 in the opposite direction as it approaches Rautatieasema station. This is a low-floor tram, designed for boarding at the center doors, and as a result has much narrower front door. 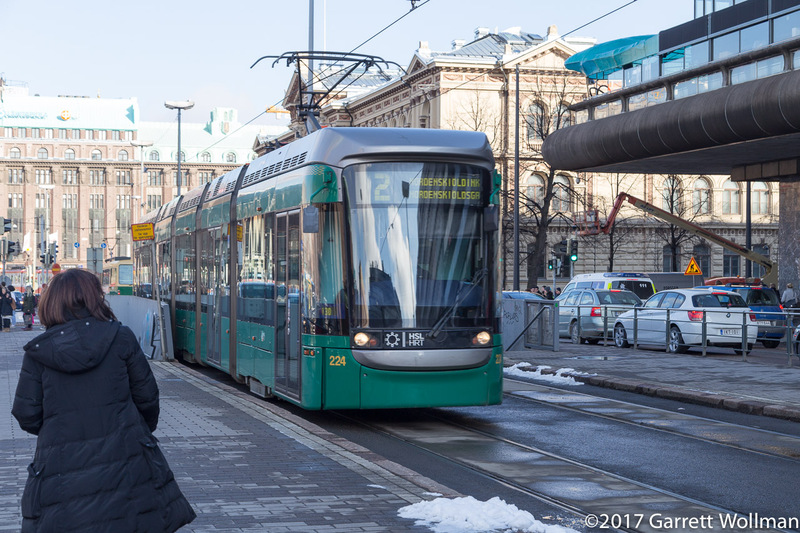 All Helsinki trams are single-ended, with doors only on the right-hand side. The tram network is supplemented by a variety of local, trunk, and express bus routes, operated by private bus companies under tender to HSL. 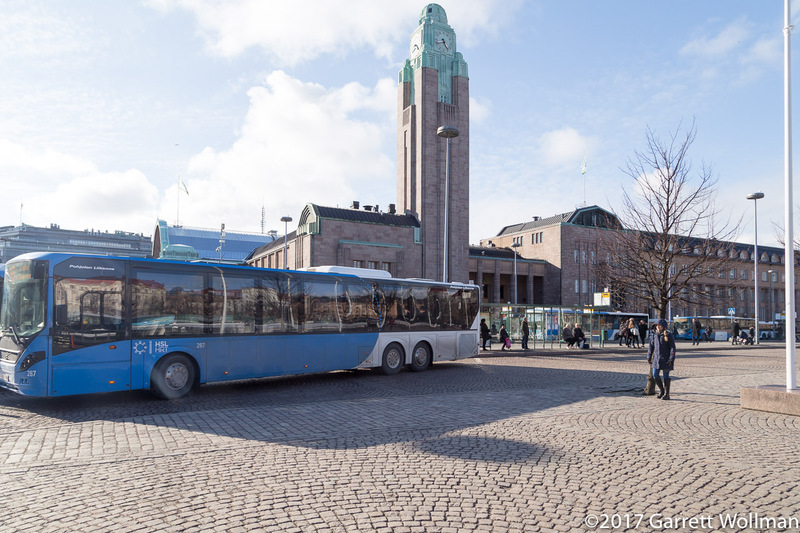 This bus is operated by Pohjolan Liikenne, a subsidiary of the state-owned railway operator VR Group. 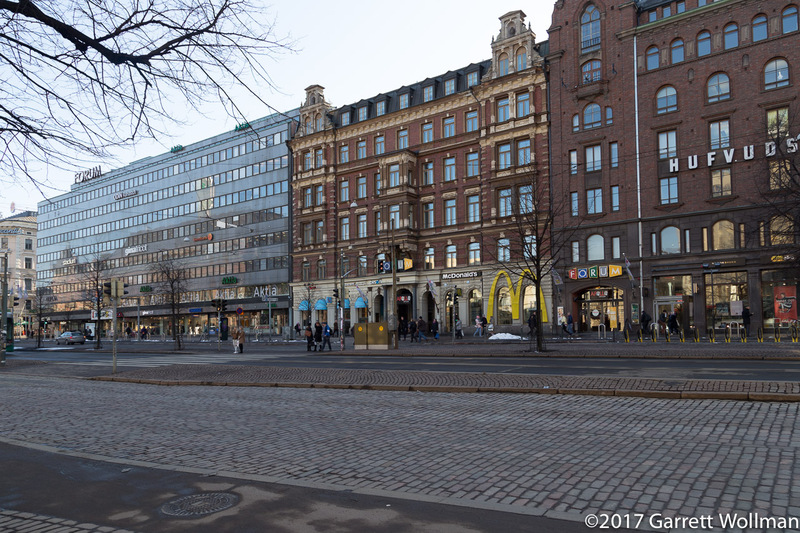 The building in the background is Helsinki Central Railway Station; the cobbles in the foreground are typical of both road paving and market squares in Helsinki’s CBD. 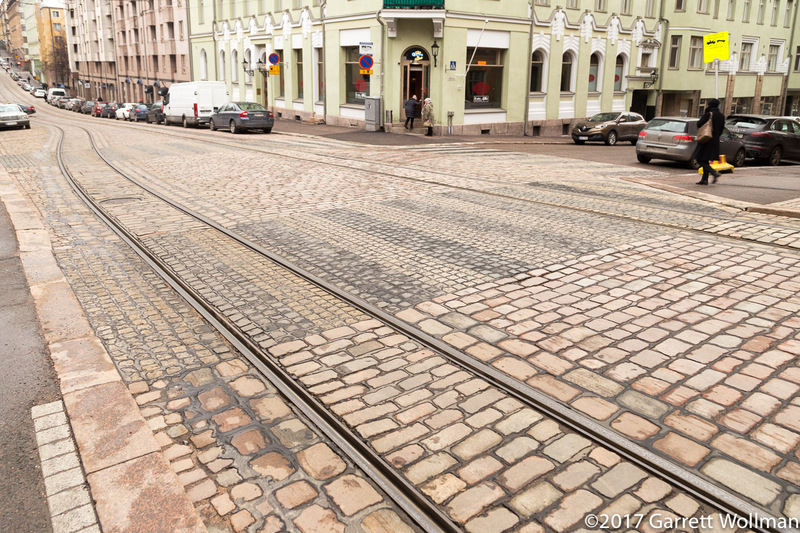 Helsinki is a fairly bike-friendly city, despite the prevalence of cobblestone streets and sidewalks. To provide a more bike-compatible surface in the CBD, cycletracks like these are paved with bituminous concrete (asphalt), and frequently provided with supplemental traffic signals as well. 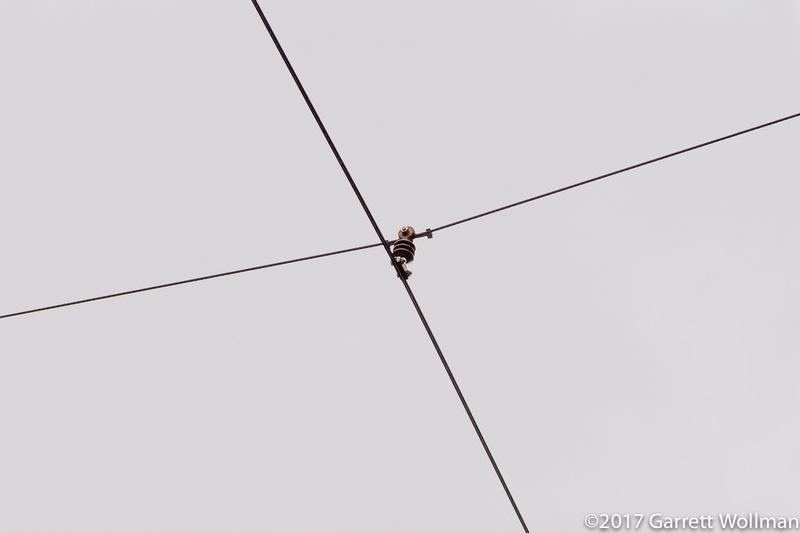 Helsinki’s modern trams are all equipped with pantographs, but the overhead electric supply still uses trolley wire. I’m not sure if there is a technical reason for this, but it is definitely less visually obtrusive than catenary, which is a plus in an old, congested city where trams are largely street-running. The 2 and 9 trams continue straight (left to right) across Mannerheimintie. The 4, 7A, and 10 trams continue across Kaivokatu from top to bottom. The 3, 5, and 6 trams turn right from Mannerheimintie onto Kaivokatu to serve Railway Square, to the left. All routes except for the 5 also run in the other direction; for the 5, the train station is the end of the line, and so it loops. 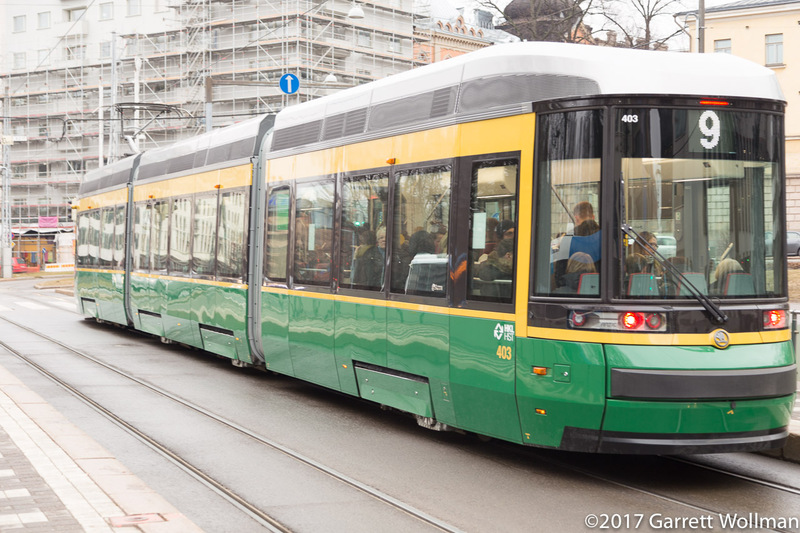 One of the new quadruple-articulated trams, operating on the 5 route, makes the right turn onto Kaivokatu from Mannerheimintie. On the opposite corner is a shopping center called “Forum”. 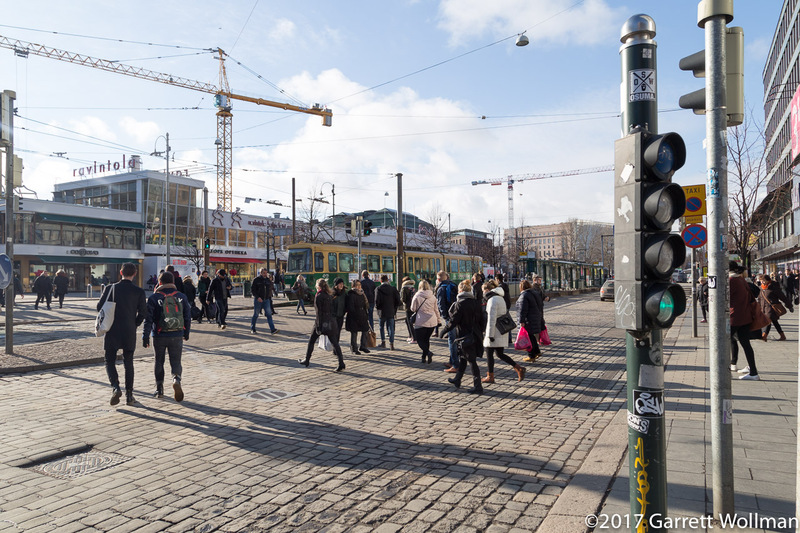 Pedestrians cross Mannerheimintie heading towards the tram stop, where an older double-articulated tram serves route 10. This is the closest stop to Helsinki Central Station on the 4, 7, and 10 routes. A traffic signal for bikes is mounted low on a pole at right; in the distance, the parliament building is being renovated. Although it’s hard to see in this photo, the cobblestones alternate grey and white at the pedestrian crossing (also indicated with pole-mounted signals). 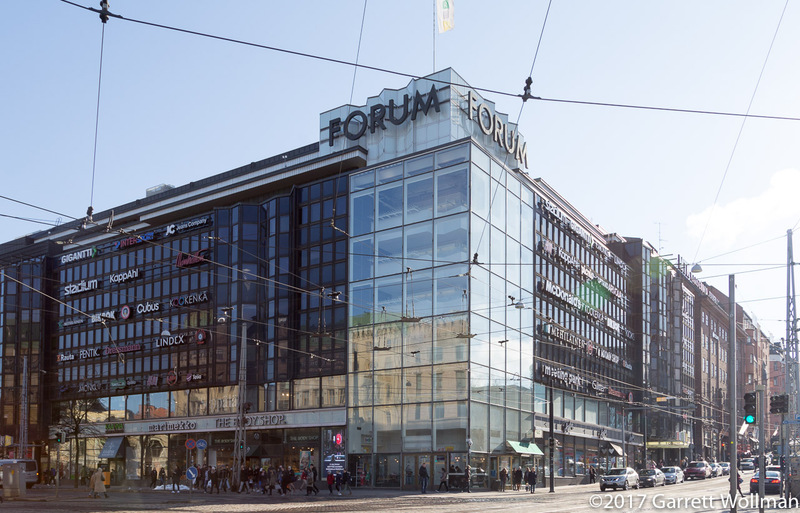 The “Forum” shopping center occupies a large building on the corner of Simonkatu and Mannerheimintie — an ideal location to serve the train station and eight busy tram routes. 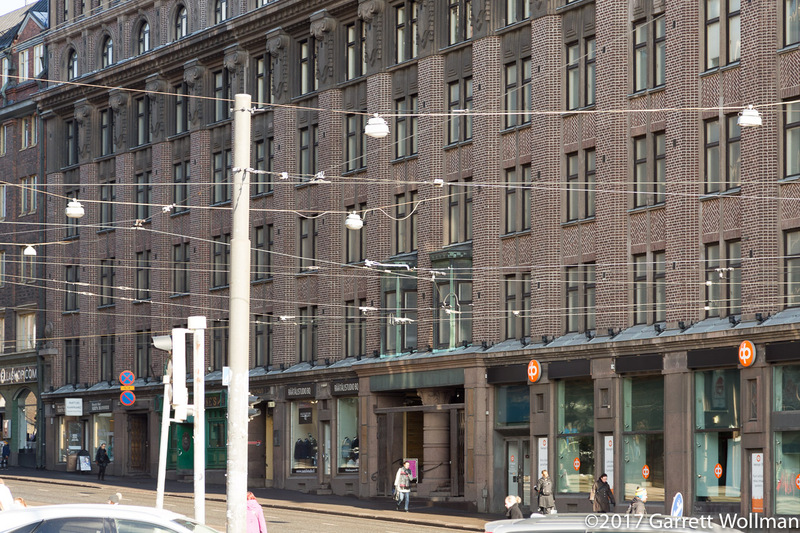 As is common for many commercial buildings in Finland, signs on the exterior indicate the names of the tenants without regard to where on the inside they happen to be — in this case, a variety of Finnish, pan-European, and global brands. My time in Helsinki coincided with the early-voting period for the 2017 municipal elections (held at the same time across the country). Most changeable outdoor advertising in the CBD was given over to electioneering, like the card on the side of this tram advertising the Green Alliance (Vihreät/De Gröna). Not to be outdone, another party has bought a card on the rear section of the same tram (I can’t read which one). The newer trams have video monitors which were also showing a variety of electoral advertisements in rotation with a “Helsinki has new trams” house ad. 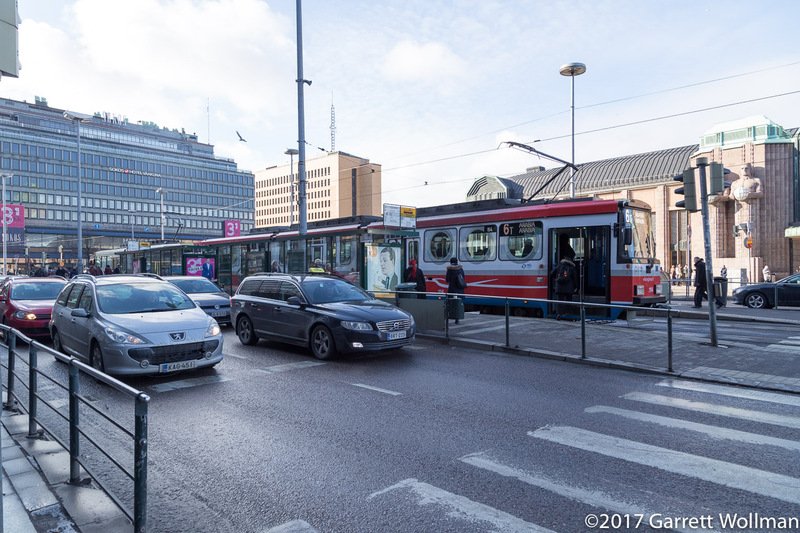 The median of Mannerheimintie is one of the few places in the Helsinki CBD where trams have a dedicated right-of-way. 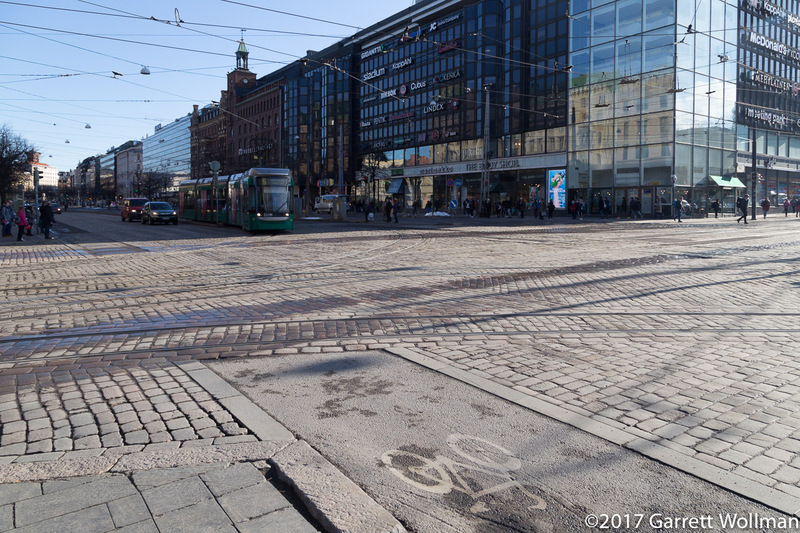 From front to back, the cobbled sidewalk, concrete cycletrack, cobbled northbound roadway, median, paved concrete trackbed for the trams, more median, southbound roadway, concrete cycletrack, pile of snow, cobbled sidewalk, and another entrance to the “Forum” shopping center. A new tram approaches the crosswalk from the left. The building at right houses the offices of Hufvudstadsbladet , the principal Swedish-language newspaper. 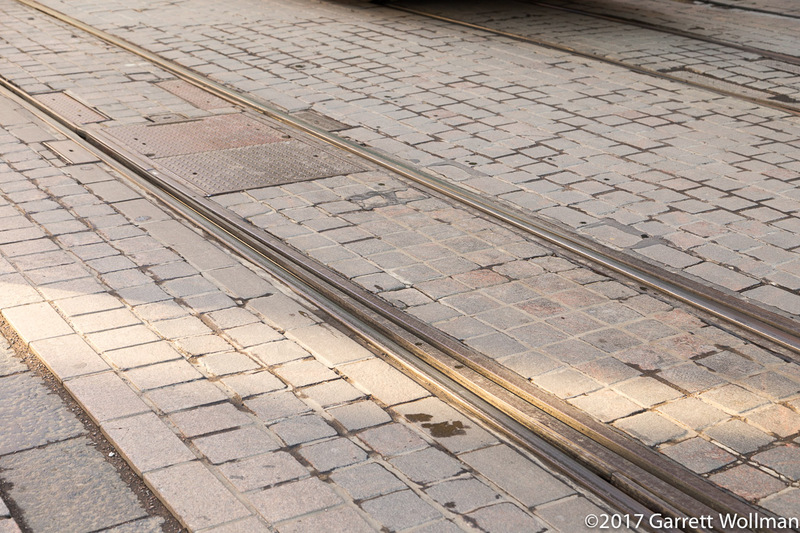 This switch would allow trams heading west on Aleksanterinkatu to turn south (left) on Mannerheimintie, but the currently operating tram routes all turn north (right) instead. Still on Mannerheimintie, this southbound 10 tram is serving Ylioppilastalo. This model of tram has a small low-floor section between the two articulations, and two people with strollers are trying to maneuver. Just south of here, the 3 and 6 routes will turn west down Bulevardi while the 10 continues straight three more blocks to its terminus. 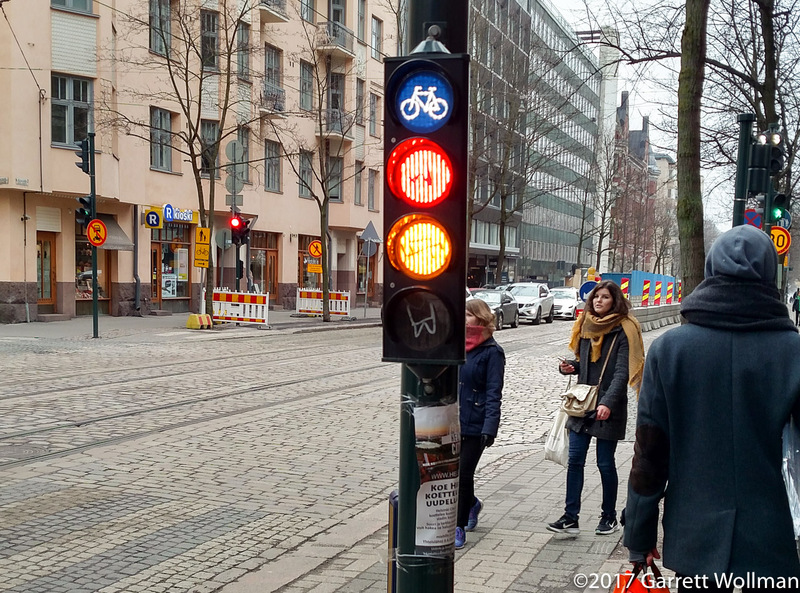 I caught this bicycle traffic signal doing a Euro-style red+yellow “get into gear because green’s coming soon” cycle. It’s on Bulevardi, I believe at Frederikinkatu. The bicycle symbol is permanently illuminated. You can also see a regular traffic signal, across the street at left, and a pedestrian signal at far right. On its way toward Senate Square, a new quadruple-articulated tram heads south on Snellmaninkatu, just passing Säätytalo (House of the Estates) after stopping a block north at the National Archives. A little bit farther north on Snellmaninkatu, the cobbled pedestrian crossing is a a bit more visible here. Note also how the tram tracks swing from a curbside stop (on both sides of the street) towards the centerline to make room for parking. 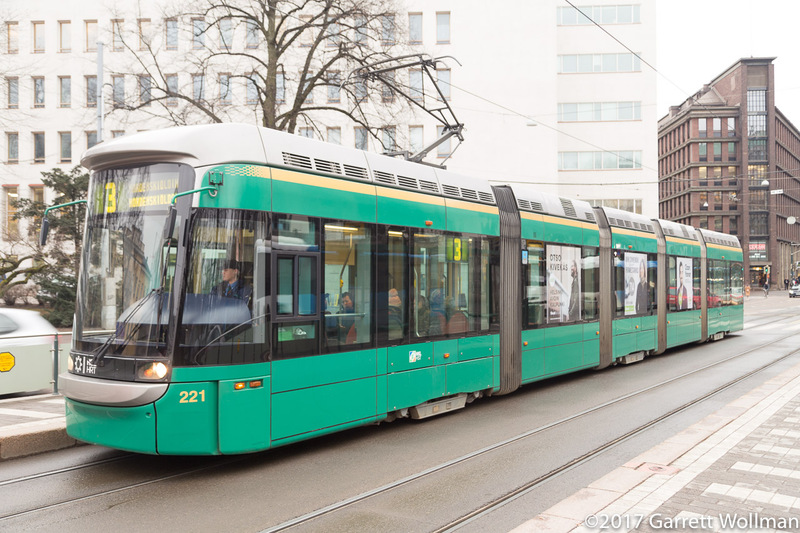 The 9 route is served with newer double-articulated trams like this one; this photo shows one serving Kaisaniemenpuisto, not far from the University of Helsinki. Two tram routes join nearby with a full wye in the center island of a roundabout, while car traffic is routed around the long way.. The tram tracks here are in a broad median on Kaisaniemenkatu. As these are single-ended trams, there are no doors on this side, affording a large low-floor wheelchair and stroller docking area. 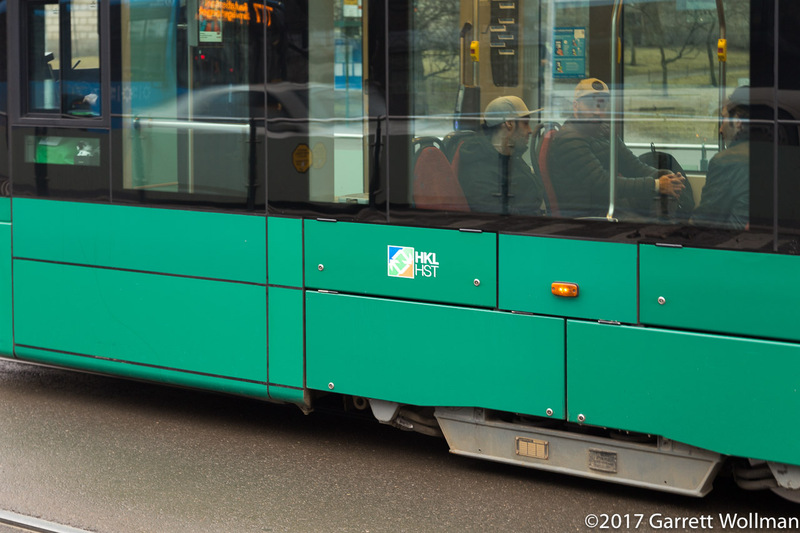 The HKL logo on the side of the tram indicates that these vehicles are owned and operated by Helsinki City Transport Agency. Another view of the new quadruple-articulated trams. The modern driver’s console includes video monitors showing not only the interior of the vehicle, but also the door side of the tram, allowing the driver to confirm when all passengers are loaded. The tram platforms are at floor level, but a “wheelchair” button will cause a bridge plate to extend automatically for boarding or alighting without driver assistance. 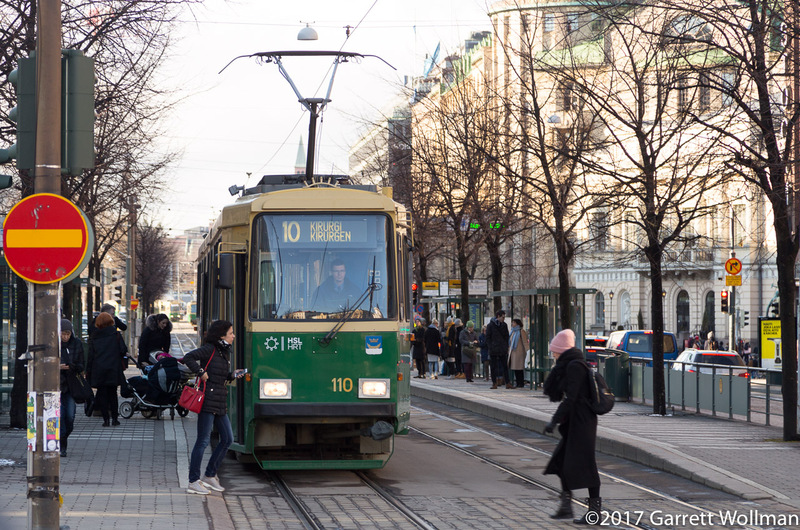 This entry was posted in Transportation, travel and tagged Helsinki, infrastructure, streetcars, trams, urban cycling. Bookmark the permalink.